Brian Westenhaus takes a look at Tri-Alpha Energy's approach to Boron fusion:fission. That article complements an earlier piece by Brian Wang on Tri-Alpha. Tri-Alpha’s position is, “We want to know the energy and location of every outgoing alpha particle.” This is important because in a pB11 reaction the harvest is high energy Helium that can be used to directly generate electricity. The news from Tri-Alpha is the discovery of two high-energy α-particles (alphas) – that will have a huge impact on pB11 fueled reactor designs because the alphas are much easier to extract and convert more efficiently into electricity. Tri-Alpha's approach is a hybrid form of fusion:fission, where high energy protons are forced into Boron 11, converting it to Carbon 12 in a highly energetic state. The Carbon 12 decays -- or fissions -- emitting up to 3 high energy alpha particles. 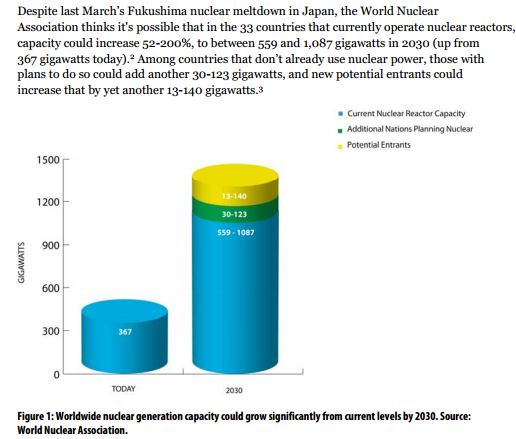 Brian Wang has more recently discussed a report by Kachan & Co. on new nuclear technologies. Here is the executive summary of the report (PDF). We have barely learned to extract energy from basic matter. Ideological green faux environmentalists want us to reject advanced energy technologies, and to return to primitivist quasi-feudal societies of a subsistence nature. Such an approach, if enacted, would result in the deaths of billions of humans across the planet. It can be assumed that most intelligent humans -- if properly informed -- would choose an advanced technology approach to a future of abundant energy.